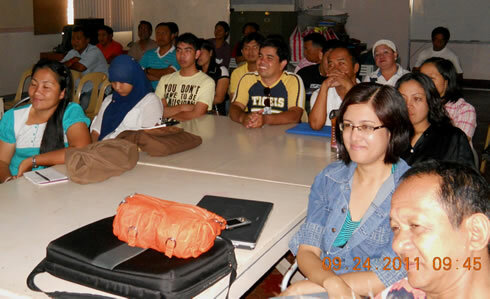 Public Administration students listening intently to the lecture. Dr. Milabel E. Ho, Western Mindanao State University Vice President for Research, Extension and Development (WMSU-VPRED) and concurrent Vice President for Academic Affairs (VPAA), underscored the need for government to adopt sound policies, especially in education, if we must develop as a nation. These policies, she emphasized, should likewise be research-based. She also stressed that, education, to be truly meaningful and effective, should highlight not only the necessary knowledge, skills, attitudes but most of all, the right values. Dr. Ho highlighted these points as she keynoted the Development Policy Research Forum which was held on September 24 at the College of Public Administration and Development Studies (CPADS) library, WMSU campus, this city. In the same vein, Dr. Ederlinda Fernandez, CPADS dean and forum resource person, underscored the imperative for researchers to establish the nexus or link, between the product of their studies and policy formulation. Otherwise, she said, research studies would simply be left to accumulate dust in shelves and become stale and useless. Dr. Fernandez encouraged the participants to develop the skill of preparing policy briefs that would allow them to present their research findings and corresponding recommendations in a convincing manner and in such a short period as three or five minutes to an hour. This may only be the amount of time that extremely busy people as our policy-makers, can afford to spare and listen to their presentations, Dr. Fernandez said. Finally, she challenged the students to pursue research, not only for the sake of satisfying academic requirements, but most of all, in order to contribute to good governance and to the solution of the country’s nagging problems. On the other hand, in her welcome message, Dr. Socorro Rebecca Felonia, CPADS Research Coordinator, pointed out that, ‘On a larger scale, education is acknowledged to be an essential factor in our country’s fight against poverty’. A number of studies, according to her, have indicated that education is a key lever to an individual’s having a better future and status in life, including potential higher income.